As someone who recently got married, I received a number of kitchen gadgets as wedding gifts. Some we had registered for, some came as a surprise. I was pleased with all of them. Stuck for ideas beyond the basics? Amy Culbertson in the Fort Worth Star-Telegram has an article on how to select some nifty gifts which will please the cook on your shopping list. To develop this gift list, I consulted with kitchen-store owners, picked the brains of fellow cooks and made a steely-eyed survey of my own kitchen-gadget habits. A few trends: Color is big, eclipsing the serious, no-nonsense stainless-steel/black look that was the height of kitchen cool a couple of years ago. 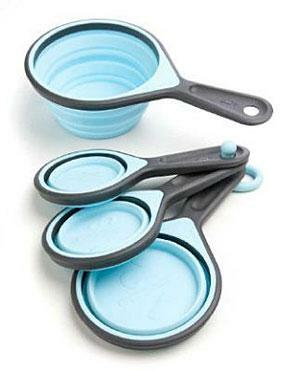 And silicone -- also in hip new colors -- is showing up everywhere from rolling pins to rainbow-hued spatulas. My gift list -- all under $40, many way under -- starts with basics for budding cooks who are just beginning to build a battery of equipment, and moves on to goodies to enhance the kitchen arsenal of those closer to the Martha Stewart end of the spectrum. There are also different levels, from the basic and indispensible to the gadgets for the kitchen of the serious cook. Some great tips and ideas in here!